At this point in the build, we need to connect everything together. With the MAC addresses noted, switch to the vSphere Client connected to the vCenter Server, select one of the vESXi hosts, Configuration, Network Adapters. 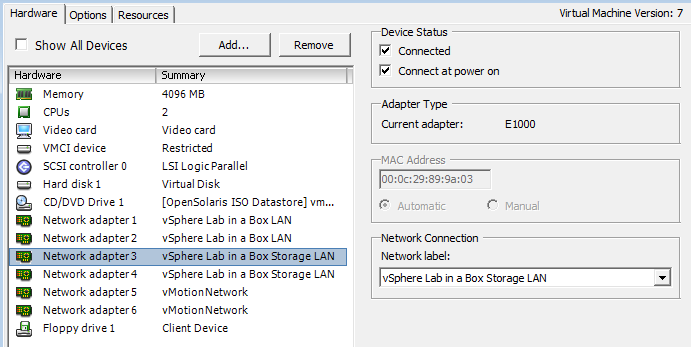 Identify the vmnics that correspond to the Storage LAN adapters. Staying on the Configuration screen, select Networking and Add Networking. 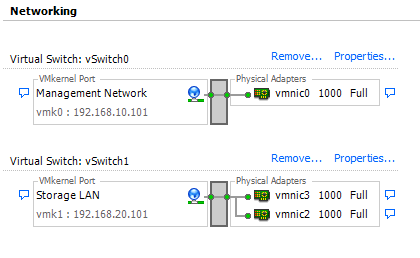 Specify the Connection Type as VMkernel, Create a virtual switch and select the two vmnics that are connected to the Storage LAN. Give the network a suitable label (e.g., "Storage LAN"), then assign an IP address on the storage LAN subnet (e.g., 192.168.20.101). Repeat this for the second vESXi host. At this point, the hosts are ready to connect to the storage. The next step is to configure our OpenFiler "SAN/NAS appliance" and share out some storage. Log into the OpenFiler web interface (https://192.168.20.1:446) as the openfiler user (default password is "password"). In the original build, I added two 100GB hard disks in addition to the 8GB install disk. We will create one as an NFS share and the second as an iSCSI target. Click the link to "Create new physical volumes"
Under the "Create a new volume group" section, enter a name (e.g., "vmware"), put a tick next to the newly created physical volume and click "Add Volume Group". First, let's create an NFS datastore. To do this, click Add Volume. Under "Create a volume in ", enter a name (e.g., "ds01"), a description (e.g., "NFS datastore"), select the size (e.g., 50GB) and choose a filesystem type (I used ext3). Then click Create. 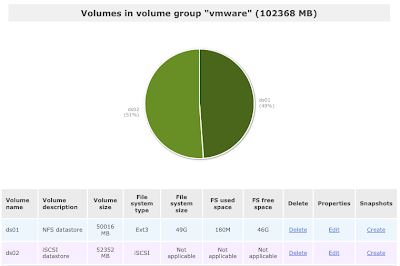 This creates a new Logical Volume in the "vmware" volume group that is 50GB in size and formats an ext3 filesystem onto it. The create operation may take a couple of minutes. When this is complete, create an iSCSI datastore by clicking Add Volume again. The OpenFiler appliance will now have the two datastores configured, but they are not published yet. Click the Services button and enable the "NFSv3 server" and the "iSCSI target server". Map the iSCSI volume to the ACL by clicking the Volumes button, then select "iSCSI Targets". The system will present a new iSCSI target name. Click Add. To assign the iSCSI volume to the target, click the LUN Mapping button and click Map. Click the Network ACL button and change the host access configuration to Allow and Update. With these options set, click Update. Finally, change Share Access Control Mode to "Public guest access" and click Update. 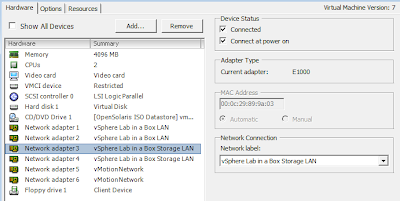 Switch back to the vSphere Client connected to the vCenter Server, select the first VM host, select Configure, Storage Adapters. Select the iSCSI Software Adapter (probably vmhba33) and select Properties. Click the Configure button and put a tick next Enabled to turn on iSCSI. Click OK and then select the Dynamic Discovery tab. Click Add and enter the IP address of the OpenFiler server. With iSCSI enabled and configured, click Rescan All, scanning for new storage devices and new VMFS volumes. If all is successful, you should see the new iSCSI volume appear. Click Storage and Add Storage. Select Disk/LUN and the iSCSI disk should appear. Select it, click Next and create a new partition. Enter a datastore name (e.g., OpenFiler iSCSI) and choose a maximum file size (doesn't matter which since the disk is only small). Finish clicking through the wizard and the new datastore should appear in the list. Click Add Storage again. Select Network File System and click next. Enter the IP address of the OpenFiler server (192.168.20.1) with a folder path in the format of /mnt/volumegroup/logicalvolume/sharename (e.g., /mnt/vmware/ds01/VMs). Give the Datastore Name something suitable (e.g., OpenFiler NFS). Repeat the adding of storage on the second vESXi host. After scanning for the iSCSI storage, the datastore should appear automatically. NFS storage will still need to be entered manually.